About Gordon – The Adam Lindsay Gordon Commemorative Committee Inc. It was a cold winter’s morning in June 1870 when a despondent Adam Lindsay Gordon sat on the Brighton Beach foreshore contemplating his circumstances. Depressed and penniless, he needed help. But these were the days when a man down on his luck could not turn to the Salvos or ring Lifeline. Just kindness and courage. With Gordon that morning were some private letters, his clay pipe, some tobacco and the lucky shilling he had when as a wild youth of 19, he departed kindred and country for a new life in Australia. In the thick ti-tree scrub beside Gordon was his Brighton Artillery Corps issued service rifle. And the rifle was loaded. His father, Adam Durnford Gordon (1796-1857), of Scottish descent, had married his cousin, Harriet Elizabeth Gordon who was a restless woman, fond of travel, and the Azores had appealed to her flighty temperament. Harriet was also melancholic and moody, traits that Lindsay was to inherit. The Gordons rented a roomy and quaintly furnished house among vineyards overlooking Horta, on the island of Fayel which is not more than six miles long. It was a place that Durnford would write “glowing accounts of the roses myrtles, oranges and vines which covered the sunlit hills and the shady valleys…” Lindsay was born there on 19 October 1833, the only son of five children, three whom died young. The family then moved to Madeira and on to Cheltenham, England, arriving about the year 1840. Cheltenham was the favoured place of retirement for conquering veterans of provinces in India where Durnford served with distinction known for “his daring horsemanship and courageous conduct” as a captain in the irregular cavalry. Lindsay was brought up on stories of his father’s military tales of honour, daring and gentlemanly conduct. Gordon was amongst the first intake of pupils to Cheltenham College where he spent only a year and then on to Dumbleton Rectory, a boarding and fighting school and later to Shooter’s Hill to prepare for the military. In 1848, he joined the Woolwich Royal Military Academy and was removed from there in June 1851 for breaking rules. A short stay followed back at Cheltenham College. His father had hoped to secure for him an Addiscombe Cadetship. This failed, and to occupy his time he sent him back to school at Worcester Royal Grammar School. Lindsay was thus 16 years when he came to Worcester. His time there must have been mainly a stop-gap, for his father continued to look for a cadetship in the military for him. A cousin of Lindsay, R. G. Gordon, had entered the Grammar School in December, 1851. 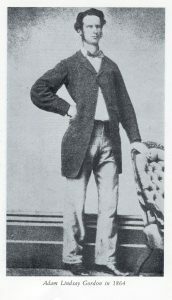 Lindsay came to live with his cousin and his family at Greenhill Place, Worcester, in January, 1852, and soon afterwards became a private pupil at Worcester. Gordon was described as “tall, very slight, very handsome, with curling dark chestnut hair, and used to dress in very horsey style”. In spite of his poetic after-fame, he evidently had the disposition for a life of adventure. His time at Worcester, though brief, was marked by a typical episode, which occurred very shortly after his arrival in the city. At a Steeplechase Meeting at Crowle in May 1852, Gordon was very anxious to ride one of the runners, and paid a certain Charles Walker senr to let him ride his mare Lallah Rookh. She was kept in the stables of the old Plough Inn at Worcester. Unfortunately, on the eve before the race, Lallah Rookh was locked up and held for a debt contracted by Walker. Gordon was furious at the news. He marched down to the stables, thrashed the ostler who tried to impede him, broke open the door, and led out his mount. He was, however, not permitted to ride the mare. Instead, he was summoned to appear before the local Magistrate, but was luckily saved from his predicament by a kindly Tom Oliver who “bought him out” for £30. Gordon’s father came to Worcester on hearing the news. As all avenues for Lindsay’s advancement according to his father’s wishes had now failed, in desperation, Durnford looked to Australia. A country which had graduated from its convict past to that of a prosperous colony where gold had been discovered. He wrote to the Governor of South Australia, Sir Henry Young and arranged passage for Lindsay to sail to Adelaide. When the barque Julia docked at Port Adelaide on 14 November 1853, there was a remarkable change in Lindsay from the wild youth who departed Gravesend in August. He neither sulked nor rebelled, but accepted his fate and got on with his life, intending to go back home in a few years. Durnford had secured Lindsay an appointment in the South Australian Mounted Police as an officer. It little appealed to Gordon who wanted to start afresh, unimpeded by social class. So instead, he enlisted as a trooper which suited his adventurous spirit. After a short period at the Thebarton barracks in Adelaide, Gordon was stationed in Mount Gambier where he met William Trainor, at the time a circus clown whom Gordon had mistakenly arrested as being drunk. Billy was to be Gordon’s life-long friend. So dedicated was Trainor that he purchased the adjoining gravesite and even named his son Adam Lindsay Gordon Trainor. He was a literary genius and he set down all his sights, sounds, and feelings into the form of poetry. Mostly with a pencil whilst horse riding from station to station. But Gordon was also his own harshest critic, discarding entire poems at whim when a single word exasperated him. In accordance with his restless nature, in November 1855 Gordon resigned from the Mounted Police and took up horse breaking, moving from one grazier to the other. Near Robe at Lake Hawdon on the station of Harry Stockdale, he met Father Julian Tenison-Woods, a scientist-priest and a classical scholar, and together they shared their love of classical literature. In 1859, Gordon’s mother died and two years later, Gordon received £6,944 which he used to purchase land in Mount Gambier. If Gordon was reckless on a horse, he was equally careless with money. Ten years later he was broke. In early 1862, he had a bad fall from one of his horses at a race meeting in Robe and was taken to the Caledonian Hotel to recover. There he met Maggie Park who nursed him back to health and they were married later that year in Mount Gambier. In March 1864, they purchased Dingley Dell near Port MacDonnell as a holiday house. The home is, today a tourist attraction with a vast collection of Gordon relics. It was in July of 1864 when Lindsay made his famous leap over a post and rail fence surrounding the Blue Lake on to a narrow edge narrowly averting a fall of over 200 feet to certain death if his horse had slipped. His first book of poetry The Feud based on a set of illustrated plates of an old Scottish Border ballad in the Mount Gambier Hotel was published in 1864. Now a man of leisure, his life was monotonous. Urged by his friends, Gordon was elected to represent the district in the South Australian Parliament. On polling day, 6 March 1865, the Poet not only topped the poll, but also brought down the Blyth government by defeating the influential sitting member, the Attorney-General Randolph Stow. As a parliamentarian, his semi-classical speeches were colourful and entertaining but largely irrelevant. Two years was all that he could stand in Parliament, resigning in November 1866. His resignation marked the beginning of the end. Gordon’s time in politics stimulated him to greater activity – poetry, horse racing and speculation. He formed a partnership to farm sheep in Western Australia, through Bunbury to the Manjimup area, chartering a sailing ship with over 4,800 Corriedale sheep. Many died on the voyage and only a few hundred survived. Nor did it help that the land at Manjimup was heavily wooded country and unsuitable. He returned to Robe, and his wife gave birth to a daughter, Annie. They moved to Ballarat and took up a livery stable behind Craig’s Hotel. Fire destroyed the livery stables, and his daughter Annie died, both within a month of each other. He had many falls from horses with many broken bones and the only cure was rest. Gordon was generous with most things that he did to the point of recklessness. He was expecting to inherit a Scottish estate, Esslemont, and he was kept going because of this knowledge. They moved to Melbourne and Gordon was by then desperate for money and rode in steeplechases, winning three races in one day at Flemington. He had to sell his favourite horse, and then news came through from England that Esslemont in Scotland would not be his. Through most of his time in Australia Gordon was never off a horse. He suffered from severe short-sightedness and confessed that everything beyond the horse’s ears was mist and blur. But that didn’t stop him from becoming Australia’s champion amateur steeplechase jockey. Which is all the more remarkable given Gordon was tall (190.5 cm) and lean. In all of his 16 years in Australia, Gordon published four books of poetry and wrote numerous articles for newspapers. Ironically, it was Gordon’s final and most acclaimed work that brought the end of his tragic life. Heavily in debt from the Esslemont claim, he could not find the money to pay for Bush Ballads and Galloping Rhymes. On the very morning that this book was placed in the book shops he rose early, kissed his wife, and took his rifle down to the Brighton Beach foreshore. And on the very sun’s face weave their pall. After his death, Gordon’s popularity grew to the point where thousands would attend his grave in the Brighton General Cemetery each year. Most children learnt about him in the school readers up to about the start of the Second World War. Since then his popularity has waned to the extent now that most people of a younger age have never heard of Gordon, even though he has a Tablet and Bust in the Poet’s Corner of Westminster Abbey, unveiled in 1934 by the Duke of York. Humphris, E & Sladen, D., “Adam Lindsay Gordon and his friends in England and Australia” (1912).